An award-winning CL caravan site, in the beautiful lake-lands of Shropshire, open all year, exclusively for Caravan and Motorhome Club member holidays. 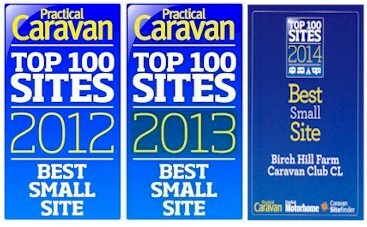 One mile North of Ellesmere in rural Shropshire, Birch Hill is an award-winning Certificated Location (CL) exclusively for members of the Caravan and Motorhome Club. It is a quiet hideaway in the heart of England, open summer and winter for up to 5 touring caravans or motorhomes. Our tranquil caravan park is dog-friendly and enjoys pleasant panoramic views across a wide expanse of green gently rolling hills: on a clear day we can see 9 counties: Shropshire plus Cheshire, Denbighshire, Flintshire, Lancashire, Merseyside, Powys, Staffordshire, and Wrexham. TV reception at our 5CL is good, and we make no charge to use our Wi-Fi. Quotations about Birch Hill from the Caravan Club Magazine – “a nice CL from which to marvel… spacious… hook-ups… woodland walkies track… information packs for newcomers… Great Site, lovely location and always a warm welcome…” – travel writer John Bateman visited and wrote about us in his ‘On Location’ article for the Caravan Club magazine. If we were to attempt to describe our typical holiday visitors, we would say, slightly tongue-in-cheek, ‘a semi-retired couple with a rescue-dog, and perhaps bicycles, here to relax and walk in the countryside’. An increasing trend is for visitors with motor-homes / caravanettes. We get many repeat visitors and with so much to see in the local area, guests often ask to stay longer than their original booking. Ellesmere is a friendly quiet lakeside market town in North Shropshire, that dates back to Saxon times. The market is on Tuesday, Ellesmere having been granted a market charter by King Henry the Third nearly 800 years ago in the year 1221. The town’s floral displays have won ‘Britain in Bloom’ prizes over several years. Ellesmere has car parks, shops, banks, pubs, restaurants, cafés, tea shops and a launderette. Camping gas is available from the local petrol station or builders’ merchant. Elsan fluids are available from two nearby canalside chandlers’ shops. Don’t miss the bread and butter pudding at the local baker’s shop – Vermeulen’s Delicatessen. Pleasant views across Shropshire, Cheshire and North Wales. Two-acre mown site (bigger than most). Eleven full power 16 amp electric hook-ups (16A EHU). Please note that we only accept 5 caravans at a time and the additional electricity points are to allow guests to spread out. 5 grassed hard-standing pitches for Winter use (in dry weather you may usually spread out on other grass areas). Our hard-standings have a proper foundation but are subtly grassed-over to maintain the rural nature of the site. Tourist information packs and local recommendations for visitors. We enjoy having visitors to the Caravan Site and recommending local places to visit and eat in and around Ellesmere, Shropshire and North Wales. Not only CL owners, we are active caravanners and members of the Caravan and Motorhome Club in our own right. This is a genuinely quiet and relaxing caravan site, with no static caravans, no seasonal pitches, no adjacent commercial caravan site. The site is well-maintained and overlooks acres of farmland. We let our fields to a neighbour who grazes cows in summer and sheep in winter, but they are usually left empty to quietly grow a grass crop for winter silage. A good base for a short stay or longer holiday: we are just 2 miles from North Wales and within 20 minutes to about an hour you could be at one of three UNESCO World Heritage Sites or numerous castles, historic houses and National Trust properties. Our lane is on one of the main Land’s End to John o’Groats cycle routes and Ellesmere is a lovely spot for country walks and bird-watching, especially around the Meres. The site is located over 200 metres up our private drive. It is discretely away from the public road with pitches in sight of our farm home, which is in a pleasant, safe, rural back-water. Access for caravans is good, with wide gateways and a Tarmac drive. Birch Hill is close enough to a quiet ‘A’ Road to give easy access, but far enough to be away from road noise.